Sunrise @ the Santa Clara Ranch. The ranch is a low fenced, 300-acre parcel of native South Texas brush where wildlife roams freely. Beto and Clare Gutierrez purchased the ranch in 2007 and have transformed it into a haven for nature photographers. A conservation easement prevents hunting and ensures that the native brush will remain untouched in perpetuity at the ranch. We have placed in-ground and above-ground blinds with water features and feeding stations to attract wildlife throughout the property. All blinds all situated to optimize morning and afternoon light. Other accommodations include a full-service guesthouse that sleeps eight photographers. 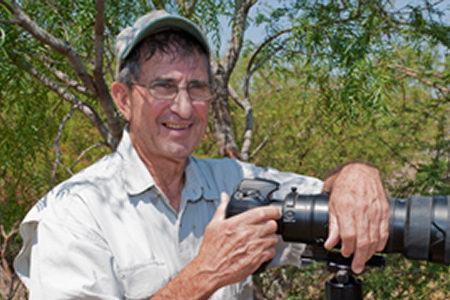 In 2009, award-winning and accomplished nature photographer Hector D. Astorga came on board as ranch manager in charge of photography operations. He has turned Santa Clara into an internationally known site for wildlife photography. Dr. Beto became interested in photography at a very young age. His pictures were mostly family and sometimes scenic. Later he signed up for a nature and wildlife photography workshop and he has been hooked since. His day time job is full time medicine and nature photography has become a passion. He continues to photograph as time allows. His images have been published a few times and he was a Third Grand Prize Winner in the Valley Land Fund Nature Photography contest in 2008. He belongs to the Rocky Mountain Outdoor Writers and Photographers organization serving as president several years ago. Him and his wife Clare live in Edinburg, TX and they will continue to share their ranch, Santa Clara, with other nature and wildlife enthusiasts. Hector D. Astorga is a professional nature photographer based in South Texas. His love of nature and the outdoors began as a child in his native country, Honduras. He is the ranch manager at the Santa Clara. He leads and conducts photography tours & workshops at multiple locations in North America, Central America, Europe and Africa. He is a six-time Grand Prize winner of the Wildlife in Focus and Valley Land Fund Photography competitions. From 2008 thru 2017 he won First Grand Prize a total of four times. He also has a 2nd Grand Prize and a 3rd Grand Prize finish in the contests. He won top honors in the 2009 National Wildlife Federation Photography Contest and in the 2012 Rocky Mountain Outdoor Writers and Photographers competition. In 2016, one of his images was selected as a “Best of Show” by the North American Nature Photography Association (NANPA) in their Annual Showcase competition. His images have been in the Top 3 awards in the NANPA Showcase for the last four years in a row. His work is featured in Nature’s Best Magazine, Audubon Magazine, National Wildlife Federation Magazine, Texas Parks and Wildlife Magazine, National Geographic Guide Books, Ranger Rick Magazine, The Chicago Tribune, Quail Unlimited, and other national and regional publications. Hector is a member of the North American Nature Photography Association (NANPA), Rocky Mountain Outdoor Writers and Photographers (RMOWP), Texas Nature and Environmental Photographers (TexNEP), Texas Wildlife Association (TWA) and of Nikon Professional Services (NPS).